Here’s something intriguing, if somewhat on the fringes of our subject. Rufus Butler Seder’s Gallop! is a very young children’s book, just published, which employs a patented technology, Scanimation. This shows animal figures as a kind of barcode-like strip. The animals move when you open a new page by pulling a scrambled underlying image which lies beneath an acetate strip marked with horizontal bars. Essentially, like silhouetted animations of Muybridge sequence photographs, we see a horse gallop, a chicken walk, a dog run, a cat leap. uses a technology based on the same principles as kinetoscopes, zoetropes, and other nineteenth century antiques that employed an optical illusion using the persistence of memory to create the flow of motion. It’s an intriguing invention, though one suspects that adults are going to be more diverted by the effect than children. Maybe it might register more if it could only generate the effect in colour. But for us it’s a useful illustration of the interconnectness of things: the fascination with optical illusions that led to the optical toys of the nineteenth century which in turn led to motion pictures, and woven into this thread the vision of Muybridge, who sought not simply to make things to move but to capture the motion of real life. 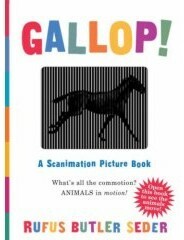 And there’s the not unrelated history of the pop-up book (to which Gallop! is to some degree related), three-D, and the wonder of seeing things break out of the confines of a two-dimensional world. It’s all animation, or animated pictures as the cinema pioneers had it – simply bringing things to life.